Affordable, protein-rich, nutritious and versatile, eggs are one of the best foods for bodybuilders, weightlifters, athletes or anyone who likes to work out and build muscles. Since protein is the building block of muscle building, a diet rich in protein is essential and eggs are one of the easiest ways to add protein fast and cheap to any nutrition regimen. 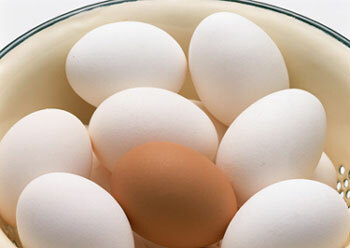 One large egg contains about 6 grams of protein with 3.6 grams going to the white and 2.4 grams to the yolk. One of the drawbacks of eggs particularly if you need to consume many is the egg yolk. While the egg yolks are pretty nourishing and packed with vital nutrients like lutein, zeaxanthin which are two carotenoids beneficial for good vision and eye health and not forgetting choline which is an important brain nutrient, they should be eaten in moderation due to the saturated fats which can add up if you eat too many yolks. The saturated fats in one egg yolk is really minimal though at around 1.5 grams but if you consume say 10-15 whole eggs, it can pretty add up. One egg yolk has also 300 mg of cholesterol and contrary to popular belief, it's important to note that the cholesterol in egg yolks doesn't raise the bad cholesterol levels(LDL) as according to research, dietary cholesterol has no impact on LDL, instead it's saturated fats the major culprit notably if you eat too much and too often. 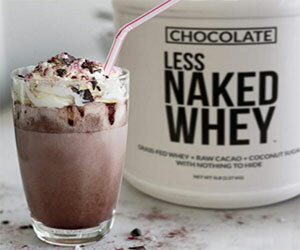 A common strategy adopted by bodybuilders is to use mostly the egg whites and the egg yolks moderately for example 5-10 egg whites and 1-2 egg yolks. One inconvenience to doing that is having to separate the whites from the yolks which can become a hassle with time notably if you eat many eggs regularly. Thankfully, you now have liquid egg whites for sale which is pretty convenient for egg eaters, so no more egg cracking and egg white separation from the yolk. The egg whites are readily available and if you want to add 1 or 2 egg yolks while cooking it, that's up to you. 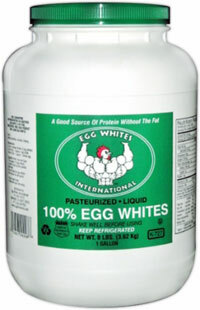 One of the best liquid egg whites to buy is Egg Whites International which is highly reputed for producing one of the best liquid egg whites product on the market and used by many pro bodybuilders and athletes. Pasteurized and salmonella tested, you get 100% pure liquid egg whites with no additives or preservatives and about 14 dozen egg whites per gallon. Stored in an airtight, freezer safe plastic container, these liquid egg whites are available in 2 half gallons, 2 one gallon containers and 4 one gallon bottles.